A few weeks ago I was attending a work dinner and ordered a side of grilled vegetables to accompany my meal. I started to eat, and cut a bite of what I thought was a miniature bell pepper. Within seconds of closing my mouth to chew, I realized I was horribly mistaken—it was not an innocent bell pepper but some sort of super spicy pepper! I swallowed as quickly as I could and did my best to continue conversation, praying no one could notice the look of panic on my face. My mouth went numb and I tried to discreetly take a large gulp of wine in an attempt to calm my mouth. Within a few minutes all was well again, but you better believe I did not finish the rest of that pepper! These enchiladas are spicy, but not in a mouth numbing, brow sweating kind of way. The homemade sauce has quite a bit of chili powder it is, but the spiciness is tempered by the filling ingredients which aren’t spicy in the least bit. A coworker passed this recipe along to me and I was sold when I saw the chocolate chips in the ingredient list. The amount of chocolate is minimal, but it’s just enough to give it a twinge of molé flavor (remember those Mexican brownie chocolate cheesecakes? Chili powder and chocolate work!). 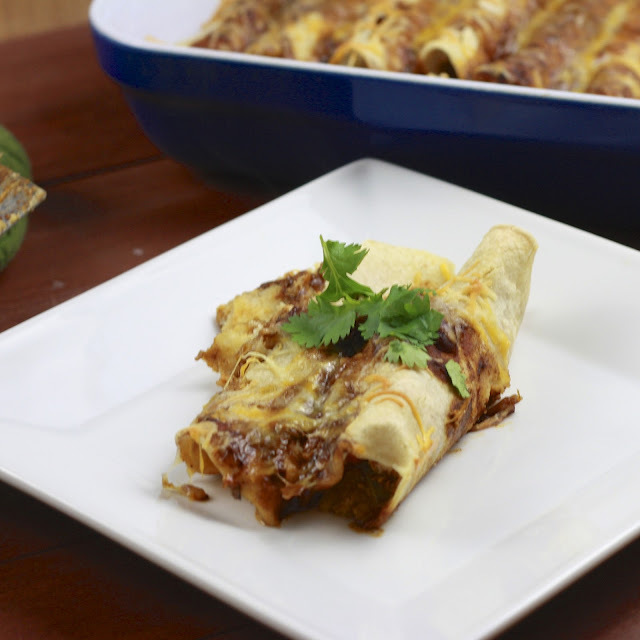 Like most enchiladas, you can fill these with just about any meats, beans, or vegetables that you like. I opted for a combination of chicken with zucchini, sweet potato, and bell peppers but these could just as easy be made vegetarian (use vegetable broth). Looking for an even milder enchilada recipe? We love these avocado cream enchiladas! 1. To make the sauce, heat 3 tbsp oil in a large saucepan over medium-low heat. Add the onion with the garlic, oregano, cumin, and cinnamon. Cook until onion is nearly tender, stirring occasionally (about 10 minutes). Add the chili powder and flour. Cook, stirring for about 3 minutes. Gradually whisk in 4 cups chicken broth. Increase heat to medium high. Boil until mixture has reduced to about 3 cups (about 30 minutes), stirring occasionally. Remove from heat, whisk in chocolate, and season with salt and pepper. Set aside to cool (can be done a day ahead of time. Store in an airtight container in the fridge). 2. To make the filling, add 3 tbsp olive oil to a large saucepan. Saute vegetables until softened (length of time will depend on what vegetables you use). Add chicken and vegetables to a large bowl. Stir in 1 cup enchilada sauce. 3. To assemble enchiladas, add 1/3 cup of sauce each to the bottom of two 9 x 13 pans. Fill corn tortillas with about 2-3 tbsp of the chicken vegetable mixture. Sprinkle with cheese. Roll up tortilla and place, seam side down, in the prepared pan. Continue with remaining tortillas and filling. 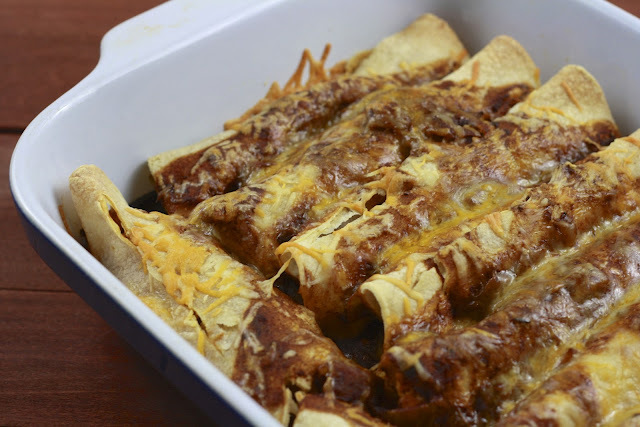 Pour remaining sauce over pans of enchiladas and sprinkle with additional cheese. Cover with foil and bake for 20-25 minutes. Remove foil and bake for an additional 10 minutes, until sauce begins to bubble. Allow to stand for 10 minutes before serving. Serve with chopped cilantro and sour cream.